On your wedding day, Seattle’s Jet City Cakes wants you to remember: love takes many forms, and can–in turn–be sweet, dark, sticky, or have you violently ejecting your inside parts through a gaping chest cavity. MAZEL TOV! Behold their H.R. 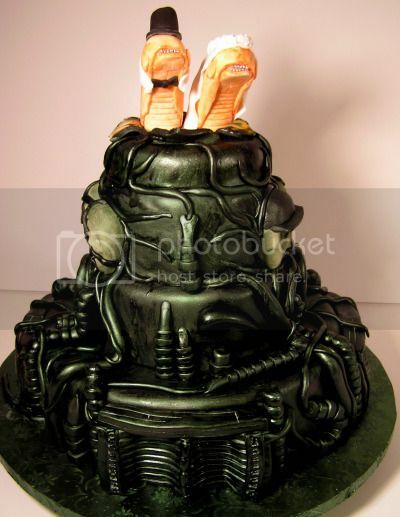 Giger Alien cake inspired by the Swiss nightmare-surrealist, who won a Visual Effects Oscar for Alien, don’tcha know. You will never see a more unusually-docile pair of alien chestbursters. I want to know how they got the icing to that metallic sheen! That’s pretty dang cool!